It's the end of October already!!! Is it just me, or did it feel like October blew through like the cold winds it brought with it? For the entire month, I participated in #inktober on Instagram and posted a sketch every day drawn with India Ink. I usually don't do black and white, so it was a good exercise to do every day to learn about the nuances of ink and value contrast. At first I used my Copic multiliner and ink. 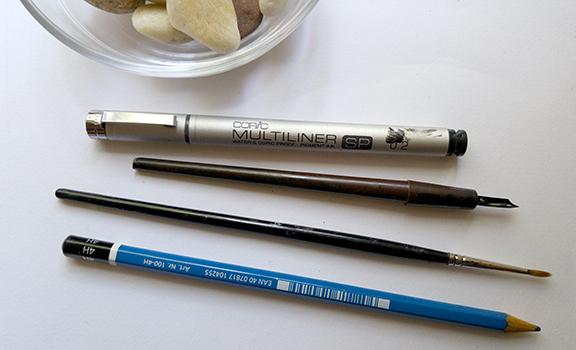 I love this pen - it's waterproof and dries quickly. Then a week or so into the month, I discovered my old croquil nibbed pen that I used to use in high school!. It's hard to see here, but the price tag of $1.15 is still on it! I used to be an avid "stippler"-- drawing realistic images using dots. I know-- it sounds totally obsessive/compulsive, but I found it very meditative. And being able to do photo realism was very validating to my teenage self. For my recent sketches, however, it was more about having fun, experimenting with line, and enjoying the freedom of sketching whatever popped into my head that morning.